f there's one Parker pen that could get nicked by some overzealous airport sercurity officer, it's probably the Parker "180". It's mean, it's lean, it's a writing machine. And it has a nib that could be used as a leathal weapon. Parker had had trouble with demolished Parker "75" nibs beeing returned because customers, used to the rougher handling of ball pens, pressed too hard and damaged the nibs. The Parker "180" nib was designed to be rigid enough to withstand a certain amount of pressure.The Parker "180" had a rigid bar on top of the nib to prevent it from bending and the ink feed held the nib firm from the other direction. It wasn't as easy as it sounds. The name Parker "180" was filed by Parker as a trademark already in april 1974 but it wasn't launched until 1977. The Parker "180" fountain pen was also heavily advertised in 1977, together with the old ardenner Parker "75". Ads appeared in the New York and Philadelphia Magazine, View Northwest and the Washingtonian while "75" and Classic ball pens was advertised in Time, Newsweek, Wall Street Journal and Sports Illustrated. Ball pens was clearly bringing home the bacon, and had been doing so since the mid 1960's, but the slim designs and cool nib of the Parker "180" was being noticed and it slowly began to sell surprisingly well. Many finishes were later made in the Parker factory in Meru, France, and especially the laque and patterened metal pens became very popular. he pen was advertised as "One nib. One point. Two ways to write", since it wrote equally well on both sides (of course most Parker pens had had this feature since the 1920's, but who cared?) The name 180 was derived from "180 degrees" - since You could turn the pen a half turn to write with a thinner line. The nib grades offered was either XF/M or F/B. It was sold with a cartridge or converter. The Parker "180" sported a slim Parker "75" like clip with many feathers, a crossed hatch, rounded plastic gripping section and a "winged" tassie that was actually designed to "hook" in the cap when it was posted on the back, to prevent the pen body from scratches while writing. In 1977 the 22K gold electroplated Imperial Fountain pen (a finish with converging lines) cost $40, while the matching Ball pen cost $20. The brushed stainless steel Flighter cost $30, and the matching cap actuated Ball pen was offered for $10. In 1978 the Floating ball pen was introduced, but it was only referred to as the Imperial, and Flighter GT Floating ball pen and was not advertised as part of the Parker"180" line. These were factory fitted with black or Blue fine points which could be changed to a stylus or super soft tip at the counter. A Parker "180" variant, the Ms Parker (designed by Pucci), was also offered as a Ball pen. A collection of Parker "180". n the March 1979 catalogue the Flighter fountain pen cost $35 The Floating Ball ben (now incorporated in the Parker "180" line) cost $15 and the Ball pen $12.50. The 22 k gold electroplated Imperial, cost $50, while the floating ball pen was offered at $30 and the Ball pen and mechanical pencil was offered at $27.50, respectively. In mid 1979 the Parker "180" was offered in five laquer finishes in pastel colours. hese first 1979 laque pens were marked on the cap (close to the lip and opposing the clip) with chinese characters that are pronounced "Pah Kuh", which translates "Parker" in Chinese. The cap lip also had the additional letters "Laqué". In the 1980 catalogue the Parker "180" Flighter cost $50, a substantial price, almost twice as much as only a few years back. The Floating ball pen cost $20, the Ball pen cost $15 and dito for the pencil. The 18k heavy gold electroplated Imperial was offered in the same range but the prices was kept a secret with the dealers being asked to consult the confidential dealer price list (which lists them at $75, $50 and $40 respectively.) The Parker "180" variant Ms Parker, was priced at $45 for the fountain pen and the floating ball pen for $25. Later, in August of 1980, a laque finish was introduced to the line and a selection of Place Vendôme Parker "180" was introduced, advertised as "an exquisite blend of Parisian charm and craftsmanship. Brilliant patterns ... engraved by old-world craftsmen". hey were offered in the patterns Ecorce (basketweave) or Grain d'Orge (fine barley), either in heavy electroplated gold or silver plated. The lined Imperial was renamed Milleraies (thousand lines). Also in 1980 Parker produced a Parker "180" in a finish very similar to the Limited Edition RMS Queen Elisabeth Parker "75" pen, offered in 1977, which was given as a fountain pen/ball pen set to Parker employees that retired. The name of the employer was engraved on an oblong plate on the pens. In 1981 Parker advertised the Heritage collection, a limited distribution collection of elite writing instruments. The Heritage Collection comprised of the Parker "75" Presidential, the Gold Parker "50", the Classic Laque and Keepsake and the Parker "180" laque. 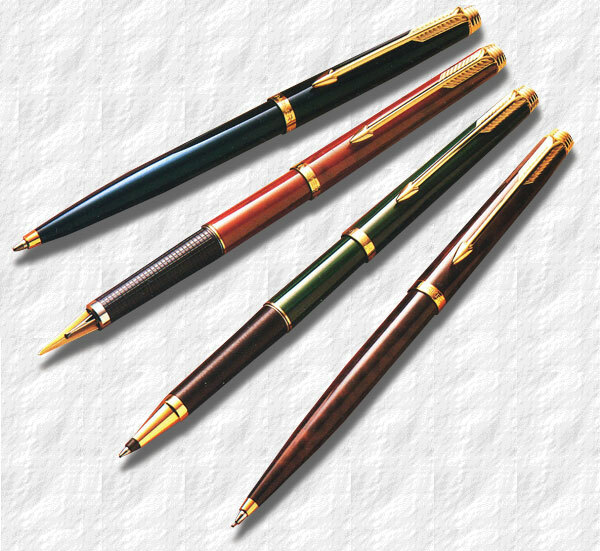 The Parker "180" was offered in the three solid laque colors of Blue, Red, Green and the brown Thuya. The Fountain pen cost $100, the Roller Ball, Ball pen and Pencil $75, respectively. he 1982 Laque range included Ecaille (brown and black, aka tortoise), Jasper (red and black), Malachite (green and black), Thuya (dark brown and black, aka woodgrain) and Lapis Lazuli (white specks on blue). The gold plated versions of the Place Vendôme collection was enhanced with Damier (moiré) and Guirlande, in addition to the Milleraies, Ecorce and Grain d'Orge, while the silver plated line consisted of the Ecorce, Milleraies, Grain d'Orge and Damier, with chromium plated trim. The original Laque collection was discontinued in 1983 replaced by cheaper more soliod colours of green, blue, red and Matte black. Even though the Parker "180" was quite popular they were also expensive pens, so the same year Parker re-vamped the entire line and exchanged the 14 K gold nib with at steel version. oing one step further Parker decided in 1986 to incorporate Parker "180" into the Classic line that had been around in different forms since the late 1960's. The nib and ink feed was slightly redesigned and the easiest way to tell the Parker "180" and Classic apart is by the nib of the Classic that has a black collar, while the Parker "180" has a stainless steel bar on one side and a plastic feed underneath. The Parker "180" has recieved an unjust reputation of being unwilling writers. This is not true. They perform very well and are excellent writers. They are however very slim and although not specifically made for women, some large-handed writers might find them a tad too slender. The gold nibbed versions are top of the line pens that are very collectible. They were made in both France and UK and also in the US, so there are many variants, prototype and test runs out there, like the bark finish Guilloché and the twisted cable finish Torsade.